These are certainly fun times for Washington State quarterback Gardner Minshew, the graduate transfer from East Carolina who first prevailed in a three-way battle to become the starting QB, and has now led the team to 2-0 record. After deciding to leave East Carolina, Minshew had committed to playing his final season at Alabama, where he almost certainly would have been a backup before beginning a career in coaching there. But then WSU coach Mike Leach called, and soon Minshew was Pullman-bound, where he had a much better opportunity to play. And to throw. A lot. Minshew has completed 72 of 108 passes for 733 yards, with six touchdowns and three interceptions. He is sixth in the nation in passing yards. 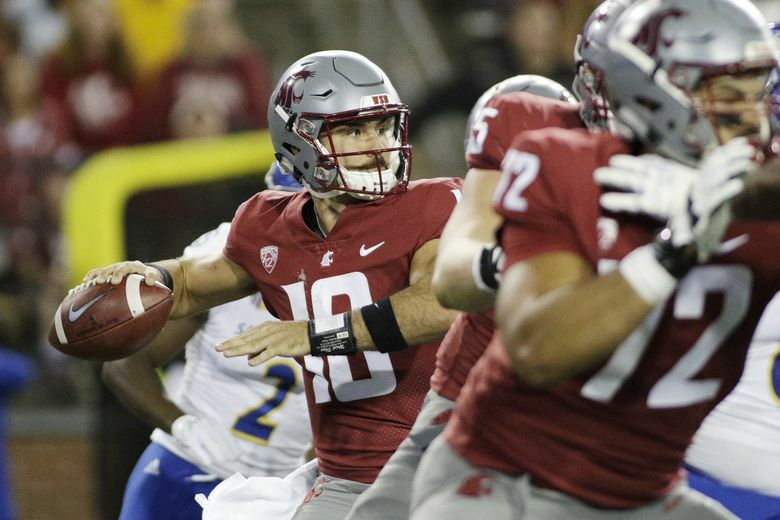 The WSU offense sputtered in the second half of the Cougars’ 31-0 victory over San Jose State on Saturday night, not scoring in that half until late in the fourth quarter. Leach called out the offensive line, the receivers and the running backs. Minshew might have escaped the criticism, but as the leader of the offense, he feels a responsibility for how the entire unit performs. Minshew said the Cougars are looking at each week as a chance to get better, and the goal is to be the most improved team each week. Minshew is piling up the offensive stats, but he is focused on just one, which became clear when asked what grade he would give himself through two games. To do that, Minshew said there are things he needs to improve. The offense will likely have to put up big numbers to beat FCS power Eastern Washington at home on Saturday. Eastern defeated WSU 45-42 two seasons ago. Minshew said playing in his first game at Martin Stadium last week “felt like home.” He is from Brandon, Miss., a town of around 22,000, close to the size of Pullman. Minshew said he feels comfortable with his new town, and his new offense, despite not joining the team until the start of fall camp in August.